Could I ask the experts what books they would recommend. I have a small collection of rugs and a reasonable knowledge of the basics i.e. I can recognise most of the standard caucasian types, I know my Ersari from my Tekke and Salor etc on the Turkoman front and can recognise a Qashqai, Hamadan etc. I am mainly interested in tribal rugs, authentic old rugs made to be used and not for export although I appreciate that many great rugs were made to sell. I have done some basic repairs and so have an intimate knowledge of some rugs construction. I want to reaffirm my knowledge of the basics and gain some expertise in Kurdish and other tribal weavings too. Forgive me if you already know many of these. I figure I should begin with more general works. While there are wonderful older books that provide historical context, probably the most important for understanding rugs from the 19th century and later is Cecil Edwards' The Perasian Carpet. The best overall contemporary reference is the most recent (4th) edition of the Eilands' Oriental Carpets: A complete guide. For a survey of tribal and village rugs, Opie's Tribal Rugs is very useful, as is Jenny Housgo's Tribal Rugs and Thompson's Oriental Carpets. For a very broad survey of flat woven rugs, see Hull and Luczyc-Wyhowska's Kilim: The complete guide. And, since I can't help but make a recommendation on 'Baluch' rugs, I think think that Boucher's Baluchi Woven Treasures is the place to start. Of course, be careful. Getting started on collecting rug books can be just as, shall we say, compelling , as accumulating the weavings, themselves. I can certainly vouch for that! I respectfully decline the "expert" mantle, but I certainly did dissipate a good deal of my youth on rug books. I agree with Joel's recommendations. I would suggest some caution in relying too much on Edwards (The Persian Carpet) regarding tribal rugs in particular. He is clearly the authority on Persian weaves, having spent a significant part of his adult life in Iran in the rug trade. Yet, he made some broad statements about tribal weaves that are clearly not accurate. The most conspicuous is that most South Persian tribal rugs (Qashqa'i excepted) and virtually all "true Baluchi" rugs are single-wefted. This is obviously not so, and it is difficult to understand how these things got into the book, as he was generally meticulous in his approach to his task as a writer, and provided much statistical detail about rug production throughout Iran during the time of his presence there. Yet, I have seen and handled a trillion Baluchi rugs, and very few were single-wefted. (I have one such Baluch khorjin face.) Similarly, I have seen very few South Persian rugs of the Arab Khamseh group that were single-wefted, though Edwards says the group is the most prolific producer in those parts, and they wove single-wefted rugs. Edwards died before his book was published (ca. 1950), and his widow carried out the final editing and polishing of the manuscript, but given the context of the misstatements, it is hard to imagine how they could have crept in through those circumstances. I have wondered whether he observed the details of tribal and remote village weaving from a somewhat remote (urban) perch, and relied on hearsay for some of the background information. Nevertheless, I am not suggesting you disregard Edwards. Just take it with a grain of salt on the tribal material. I ratify Joel's mention of Jenny Housego's Tribal Rugs. She was formerly in the textile department of the V & A and lived for a long time in Iran, making a point of associating with tribal peoples and studying their weavings. I heard her speak a few times at the Textile Museum in Washington D. C. in the early 1980s, and she came across as very authoritative, as well as especially good-humored about the whole business. Moreover, the book is probably available at relatively modest cost. It is small but packed with good and interesting information. There are three editions that vary only in minor secondary respects, and any edition at a good price would do. I recently acquired Brian MacDonald's Tribal Rugs, Treasures of the Black Tent (Third edition, 2017), and have been very pleased with it. It addresses many of your preferred goals. Good (book) hunting! I realize that I should have been a bit more practical in my recommendations since some are very expensive (both the Brüggermann & Böhmer and the Burns start at about $250). I think the best and most comprehensive starting point would be the Eilands' Oriental Carpets: A complete guide (4e). You can find used hardcover copies for under $25. While this edition is now almost twenty years old, the unfortunate reality is that there has not been enough in the way of new rug scholarship to make it seem particularly dated. I agree with Rich's assessment of the weaknesses and strengths in the Edwards book. It's an invaluable source on many details about twentieth century Persian rug production but would certainly not be the 'go to' reference on tribal rugs. Anything by P. R. J. Ford is top notch. That book belongs in Joel's short list of the best and most useful works. One of the curses of rug literature is that it is full of works by writers who simply did not know what they were talking about. They recycled unproven but widespread conventional wisdom, copied others, or just made things up. (A percentage of them compensated with nice illustrations.) The thing about Ford and Edwards is that they did know what they were talking about, and by and large, confined themselves to that. Ford was much like Edwards in that he earned his knowledge through long experience in the industry. Aside to Phil: Don't get too lost in this list of sound, practical references. If you take on a bad case of Baluch fever, see if you can find a reasonably priced copy of either one of Frank Diehr's catalogs: Three Dusty Dozen or Treasured Baluch Pieces. I agree with Rich that Jim Ford is one of the most knowledgeable folks out there and the book is filled with detailed and useful information. I didn't include it on the short list because I've found the book's organization, clustered into design categories (e.g. "universal designs", "geometric designs" and sub-categories, "geometric medallion-plain designs") awkward and off-putting. It ends up distributing information on rugs that were woven side-by-side all over the book. However, at under $10, a used copy should undoubtedly be on the basic rug book shelf. In the interest of full disclosure, I should mention that my copy of Ford's book disappeared from my Rug Book Library Annex (aka, "my attic") quite a few years ago, so I haven't looked at it for that long. I am sure Joel's annoyance with its shortcomings is well-founded. There is a series of books published by the Antique Collectors' Club; the book that Rich mentioned by MacDonald is the latest one. They are a bit dated with respect to current opinion on some attributions, but are chock full of good examples and are really useful. ...are all on my shelf. Thanks to everyone for a great list of books. I have the Jenny Housego tribal rugs and Ian Bennett's caucasian rugs but the rest I will begin hunting for. Its good to have a quarry and I mean that in the hunting sense. I feel a primaeval urge to begin the tracking of my prey now. It is a shame in some ways that the internet makes life so much easier when doing these things. There is something magical about hunting second hand book shops for specific tomes. I remember the thrill of finding the narrative of Arthur Gordon Pym in an old booksop on the mediaeval wall of Chester many years ago or a beautiful hardback of the Life of Samuel Johnson in a small Welsh Town. My main prey this year is a Sauj-Bulach rug, that will be my quest. I think they are wonderful and since joining this site I know quite a lot about them. My main prey this year is a Sauj-Bulach rug, that will be my quest. Well you have a VERY valuable collection there Chuck! I have put the cheapest price of the two that interest me, the only two I searched for on Bookfinder (arguably THE broadest book search engine on the web), below. And they go way WAY on up from the above prices for other copies of same! Not saying you can't find them cheaper somewhere, but where I live I have to let my fingers do the walking. Note: We don't discuss market values here (please see paragraph atop this page). It's our belief that the price someone paid or wants to get for something is a distraction from what we believe are the more important aspects. That's as true for books as it is for rugs. Its always handy to have a talisman when you are on a quest, so thank you Joel. The rarity of good quality rugs in my part of the UK means that I will require some supernatural assistance if I am to succeed. This is a problem for me, learning from books is one thing but I need to see some more rugs in the flesh. It has been years since I had the opportuntiy to browse private collections and get to see and touch so many wonderful things. I think I need a plan, find some online experts (ticked that one), find some like minded people in the UK I can visit, make a nuisance of myself in all of the best rug shops (have started that one), go see the V&A collection. Any other tips welcome. I intend to gain a good grounding in tribal rugs and then turn my attention to caucasian rugs for which I will need a Talishman. That's a joke by the way. 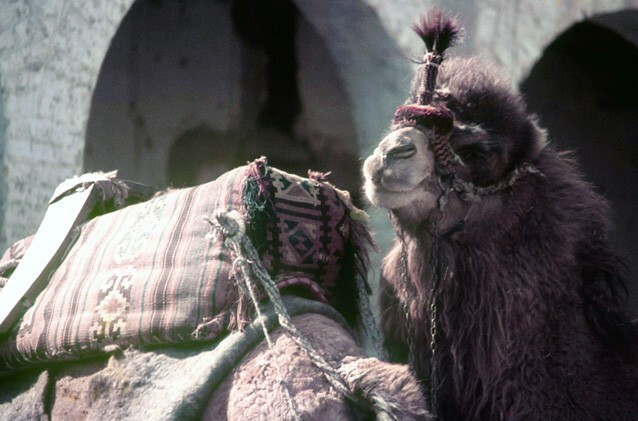 Well to aid you in your travels Phil, and to carry your baggage (and any acquired rugs) as you go from village to village, you are welcome use my Bactrian camel should you so desire. Good luck in your wanderings! Photo taken west of Mazir-I-Sharif, in Aqcha bazaar, Balkh Province, Afghanistan circa 1979 - just before the overt Soviet invasion. Last edited by Kay Dee; September 20th, 2017 at 08:48 AM. Reason: I'll get where I took this photo right yet! Aren't you only about a three hour drive from the Cotswolds? There are a couple there that I would love to spend some time in. Yes they are on my list. There is something of a north south divide and unfortunately the north is not great for rug hunting. I have found one good dealer so far. I need to head south and you should understand that although three hours is but a short trip for you in the US, here in the UK it is considered a serious journey for which I will need to make provision. There is a danger that having made the trip that the proprietor doesnt really want to engage with me. I had a bad experience with a well renowned dealer last year. I was very excited to talk to him about rugs but it was clear he had fallen in love with money and fallen out of love with rugs. That's a risk I will have to take. I think I will head for the south coast and hit the Cotswolds on the way some time this Autumn. Hopefully my enthusiasm will fuel the journey and with my Talisman tucked in my pocket I will find a treasure. Last edited by Phil Bell; September 21st, 2017 at 10:09 PM. I think I will head for the south coast...some time this Autumn. Hopefully my enthusiasm will fuel the journey and...I will find a treasure. I am just about overcome with nostalgia! As the saying goes, "Been there, done that!" I hope you find a treasure too! As the saying goes, "Been there, done that!"! And I bet you have the T-shirt too Rich, and other goodies collected along the way!